If you haven’t already heard, Fuji has another big sale happening on just about all their lenses. A couple standouts are the XF 14mm f/2.8 for $499 (save $400), and the XF 16mm f/1.4 WR for $699 (save $300). On the long end, you can get an XF 1.4 Teleconverter for $100 if you pair it with either the XF 50-140mm f/2.8 or XF 100-400mm f/4.5-5.6. And of course, B&H has all the same deals as well. Get ’em while the gettin’s good. The response to my Prepping for South Africa post has been incredible. No other blog post on Fuji vs. Fuji has generated so much thoughtful feedback so quickly. I really appreciate it all, and as I catch up on my email, I am seriously rethinking my gear selection yet again. Here’s the latest. Well, readers are decidedly in favour of me bringing the XF 100-400mm. Tweets, Facebook Messages and emails all say bring it. This prompted me to do a bit of my own reading about the lens, which lead me to this fantastic piece by Daniel J. Cox about mirrorless telephoto zooms. Fuji has an awfully impressive showing. I certainly won’t mind the chance to do a little testing of my own with a lens like this, but I want to do what’s best for the trip, first and foremost. So, the current plan is to see how things fit once my Airport Essentials arrives. That should help determine just how many zoom lenses I’m going to bring. Now of course I’m asking myself if I really need the XF 50-140mm f/2.8. In some ways, it could be indispensable. The faster aperture might do wonders during dawn and dusk game park drives. But it’s another big telephoto lens with at least some overlap (depending on which teleconverters I have mounted) to haul around. Given how close we could get, there’s no way I can go on a game drive with 50mm being my widest focal length. Readers also reaffirmed what my research indicates, dust will be a real problem when driving along the dirt roads in the game park, so lens changes are almost certainly going to be impossible. That got me thinking about a lens I don’t think about very often, the XF 16-55mm f/2.8. One of my big summer comparisons is going to be this lens pitted against primes in its range, but it might just be the perfect companion to one of, if not both of the big zooms. Standard focal range, weather and dust resistant, 77mm filter thread. Suddenly a lens I wasn’t even looking at before is in the running. This trip could be an all red badge affair. In truth, when I bought the XF 16-55mm f/2.8, it was with the intention of using it almost exclusively as a travel lens. Visions of trudging through the rainy lakes, dales, and moors of England came to mind. My sole reason for not considering it at first was my desire to travel with as little gear as possible. I wanted to minimize. I would have a really hard time leaving the XF 35mm f/2 WR behind, and probably won’t, but it’s covered by the XF 16-55mm f/2.8. *Denotes gear I’ll bring on the game drives. Ugh. I really don’t want to have to do this, but if I had both the telephotos along, I feel I would almost have to bring a third body of some kind along to cover the wide end. Going X70 has the added benefit of my wife having an “adorable little Fuji” at her disposal, but there could be a risk of dust contamination during the game drives, and it means another set of charger/batteries to bring. Thanks again so much to everyone who wrote, tweeted and messaged me their feedback. It’s been immensely helpful, and I’ll be sure to post more as I continue to sort this out. I’m hyper aware that this is an awesome problem to have, but the struggle is real, and it continues. More to come. Well isn’t this fortunate. Fuji has officially announced their XF 2X Teleconverter. The “FUJINON TELECONVERTER XF2X TC WR” is a high-performance teleconverter capable of multiplying the focal length of mounted lenses by two. This gives the XF 50-140mm f/2.8 and effective focal length of 100-280mm f/5.6, or 152 to 427mm in 35mm equivalence, and the XF 100-400mm f/4.5-5.6 reaches all the way out to 200-800mm f/9-11, which is 305 to 1,219mm in 35mm. That quite a bit of a slow down in aperture, but over 1,200mm of reach is going to be tough to resist. Also worth noting, we lose Phase Detection on the XF 100-400mm f/4.5-5.6 altogether with the XF 2X TC attached thanks to the reduction in aperture. That could pose a bit of a problem for things like early morning game park drives or bird photography outings when higher ISOs are already common. It will be interesting to see how this lens performs with the TCs attached. That extra reach also means extra size and weight with the new 2x weighing in at 170g, or 40g more than the 1.4x and measures twice as long at 30.2mm. I’ll be getting close to maxing out the height of my bag already, so be mindful of your max carry size before you place any preorders. Edit: Jonas Rask already has one of his typically epic reviews up for the XF2X TC. Man, that guy is on fire these days. In starting a comparison including the new 50-140mm, I was struggling with how to categorize Fuji’s lenses. My initial thought was to describe the 50-140mm f/2.8 as “Pro” with all other lenses being “Consumer.” The trouble with that of course is Fuji already have a second consumer-focused set of lenses that carry the XC moniker. Perhaps Fuji has already found a way of differentiating between these two levels of quality within their XF series of lenses though. The red badge. Just two lenses carry this badge officially to date, the 16-55mm f/2.8, and the 50-140mm f/2.8, which are the two lenses unofficially referred to as “pro zooms.” These lenses also happen to be the only two lenses in the lineup that come with the new Nano GI coating so the red badge might be the signifier of this coating’s presence,2 but it could just as well be their version of the gold band found on Nikon’s pro glass or the red band found on Canon’s L lenses. It’s clearly not indicative of weather sealing since the 18-135mm f/3.5-5.6 has the standard black XF badge. Looking back at my my images from Photokina, it appears as though the XF zoom badge was deliberately left off of the the new Super Tele-Photo Zoom 140-400mm f/4-5.6. This would suggest that Fuji do have an idea of what the red badge stands for, and that they hadn’t yet commited to adding the stamp to the new Super Tele Zoom. Or maybe it just fell off. It is a prototype after all. No XF Zoom badge? What does it mean??? 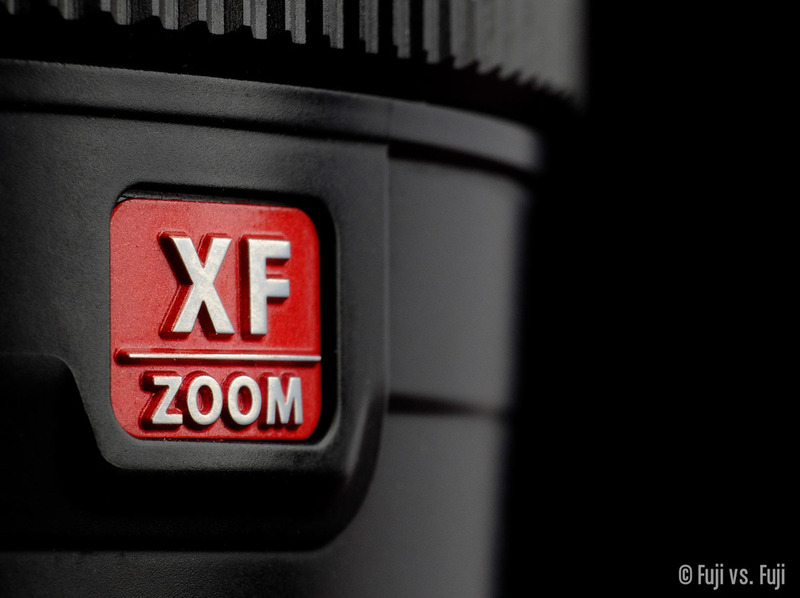 It’s interesting that Fuji have created a new tier of zoom lenses with these latest releases—I’d bet the farm that this isn’t a revised design language for all lenses going forward, and I suspect they won’t dish out the red badge often—but it’s odd that there doesn’t seem to be an official word on what the red badge stands for.